I realize you need bowls for poke bowls. But my bowls were still in the dishwasher from our oh so very delicious ice cream sundaes the night before (have you tried the cashew flavors yet? Chocolate Cookies N Cream is my favorite!!) and it was NOT going to stop me from making this the next day. Nevertheless, I’m here to amuse and possibly sway you, with the clever notion of swapping tuna for watermelon, yes, watermelon, as a light meatless meal with no bowl in sight. Considering how similar in color — and thanks to the recipe found in Bon Appetit magazine, this month — I couldn’t resist highlighting one of my favorite summer fruits. And perfect over rice I make using a top-notch coconut creamer and some lemongrass. Digging my teeth into sliced watermelon — with heaping mouthfuls between my cheeks as it would drip down my chin and onto my shirt — was one of the moments I fondly remember growing up … the loud, terribly messy, chomping, and plenty of it. I wouldn’t have it any other way. These days, the chin-drip thing remains, but I do try not to drip on my shirt. Albeit, machine washable summer essentials are still a good precaution. And if you ask me, this is one of the few things better than simply-sliced watermelon. What is poke` anyways, you may ask? 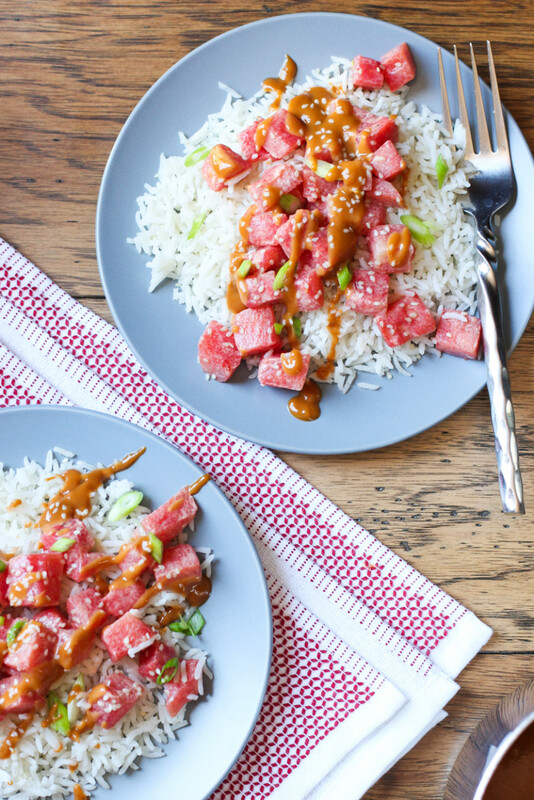 It’s a Hawaiian staple (pronounced POH-kay, not POKE-ee), usually made with raw tuna or salmon, which literally means “cut pieces” and served over seasoned rice. Think: deconstructed sushi in a bowl without seaweed sheets. Poke places (not Pokemon Go – whose hooked? are your kids eating up data like mine are? oof.) 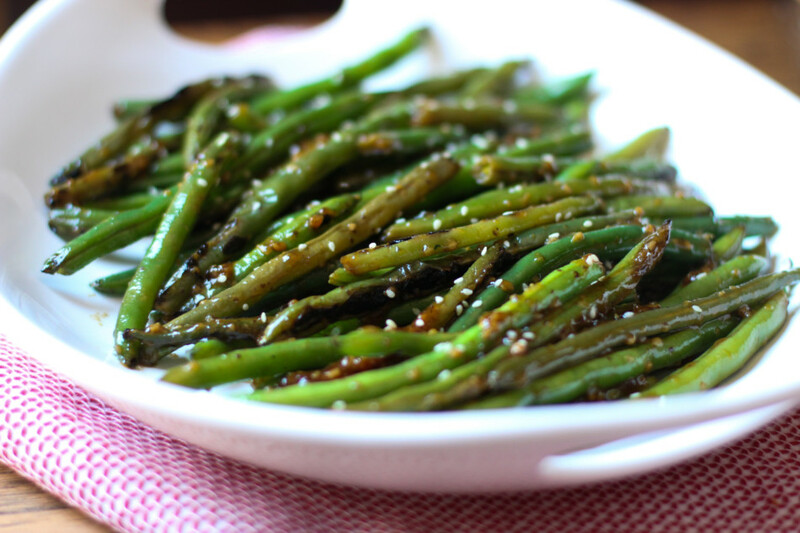 have been popping up all over LA like Starbucks’ little Hawaiian cousin and since we avoid things like gluten, soy, and tuna (quite high in mercury: a neuro-toxin sort of thing) we made this plate of goodness at home with a side of blistered green beans with a ‘teriyaki’ sesame glaze. Oh, those green beans. YUM. And the poke! 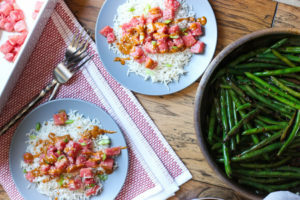 The watermelon marinade, which later turns into the sauce, transforms the fruit from sweet to sweet and tangy, then takes another turn into a powerhouse of layered flavors – the umami effect – when reduced. No one ingredient stands out, yet I was surprised to pick up a peanut flavor (there isn’t any) which reminded me of a satay sauce. Simply put, it’s a keeper. It’s also now the sauce for the sushi we usually buy at whole foods – one that comes with a gluten sauce and goes right into the trash. Hallelujah to our new-found sushi sauce. 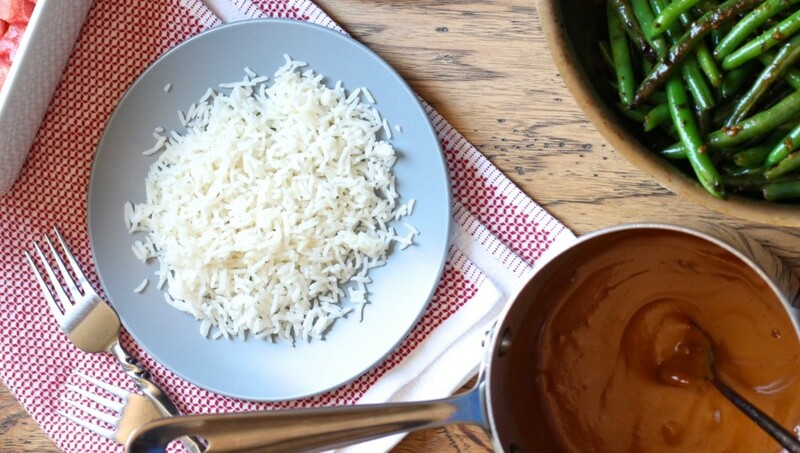 The rice doesn’t have any strong tropical coconut flavor from the creamer that could overpower, rather it gives a rich creamy coating to the starch, sometimes known for its’ blandness. In other news: in case you were wondering whether I went off to some far away place. I wish. Introspect moments have been my vibe the past month. I needed a moment with the likes of Blind Pilot to help clear my over-stimulated head before coming back with food. Music is my heebie-jeebies antidote. I’ve been overwhelmed by things like medical research on neurodevelopment, mitochondrial dysfunction, and GI issues, the crazy acts of violence in the news and all the hate stemming from it (and talking about the racism in color, gender, and disability with my children), and my inner issues with expectations: not doing enough or at other times doing too much … not exactly a mood enhancer for writing about food, as you can imagine. The juggle of family, health, blog, life…it all pulls on my strings sometimes. And so the whole ‘how long can I do this thing’ kicks in that has me step away to look within for strength and to recalibrate. We all need it sometimes, right? I know I do. By the way, since the last post – Michael and Ely (for those new here, are my twin boys with the diagnosis of autism) have been responding positively to the acupuncture and holistic energetic treatments much to our pleasant surprise. I felt it would be beneficial, but you know how sometimes doubt sets in about the actions you choose? There was a little bit of that going on at first. During this time, we have been giving the twins high doses of B vitamins due to mitochondrial dysfunction (will talk about that discovery another time, too much for now), which can overstimulate neuron receptors in the brain according to our Biomed doctor. Interestingly, they have bypassed the hyper side effects. I attribute it to the acupuncture. Quick story: Our first trip to the acupuncturist, Michael received a needle on the inner part of his lower leg (near the ankle) and immediately had a look of concentration then lifted up the other (left) leg and asked “more needle please”, we think maybe to balance whatever he was feeling on the right side of his body. I could hardly contain my welled up tears; our acupuncturist reminds us every time how they do better and are more in tune than most adults. The kind folks at So Delicious provided me with products that contributed to this post. As always, the opinions are my own and think they make great tasting products. 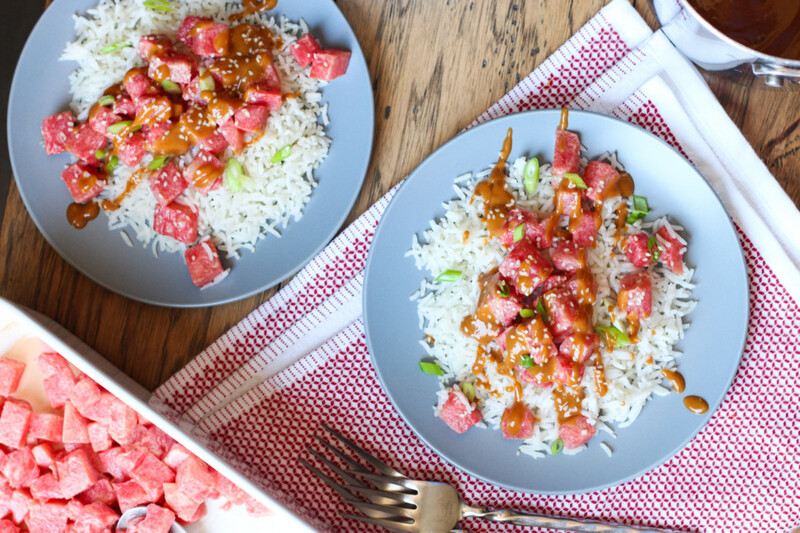 A new summertime take on the traditional poke bowl - with watermelon! 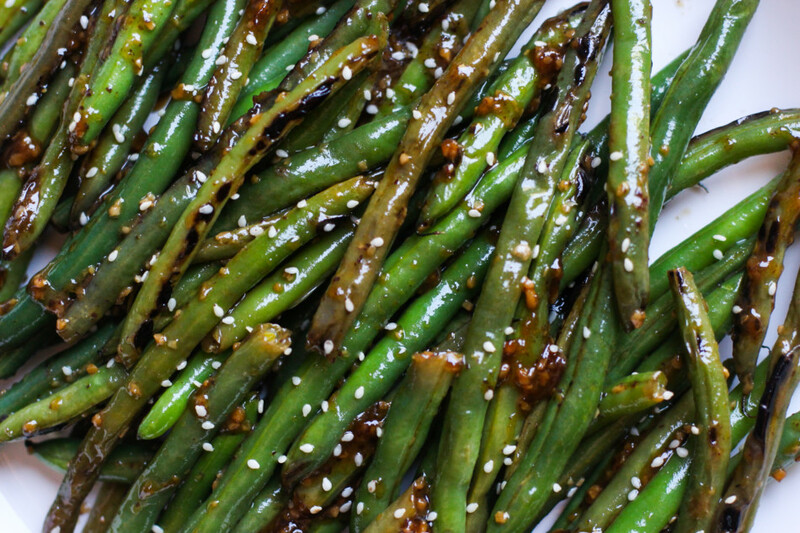 Add a side of green beans glazed in a teriyaki sauce for a light and delicious meal, perfect for hot summer days. Enjoy! 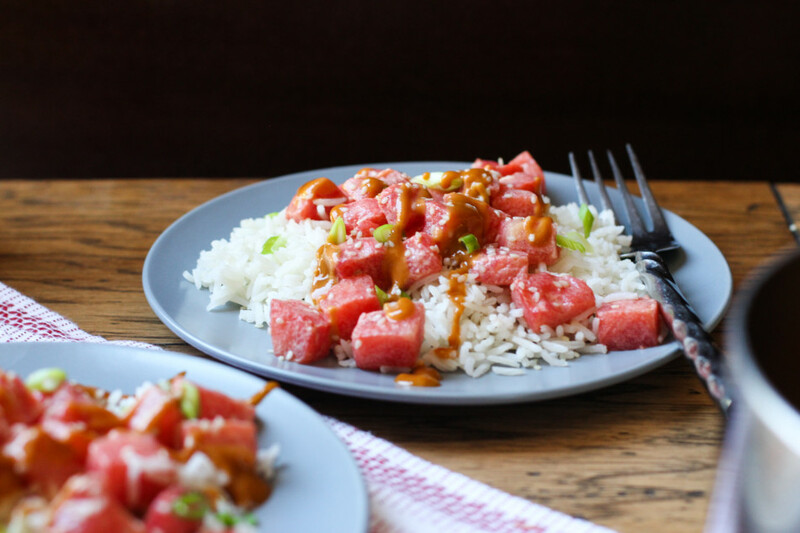 For the watermelon poke: Place cubed watermelon in a deep casserole dish or resealable plastic bag. Purée rice vinegar, sesame oil, coconut teriyaki, lime juice, tahini, nectar, and sherry vinegar in a wide-mouthed jar using a hand-held immersion blender. If unavailable use a blender or food processor until smooth. Pour over watermelon, cover or seal and chill for at least 4 hours or one day (I marinated for 12 hours). When done marinating: set a medium saucepan over medium-high heat with coconut creamer, water, and lemon grass. When boiling, add a tablespoon of raw sugar, and rice; cover and reduce to low. Cook for 20-25 minutes, or until rice has fully absorbed the liquid. Meanwhile, pour marinade into a small saucepan and set over medium heat. The watermelon will have a light coating from the marinade. Note: the longer the watermelon marinades, the more reserved liquid you will have, creating more sauce for drizzling. 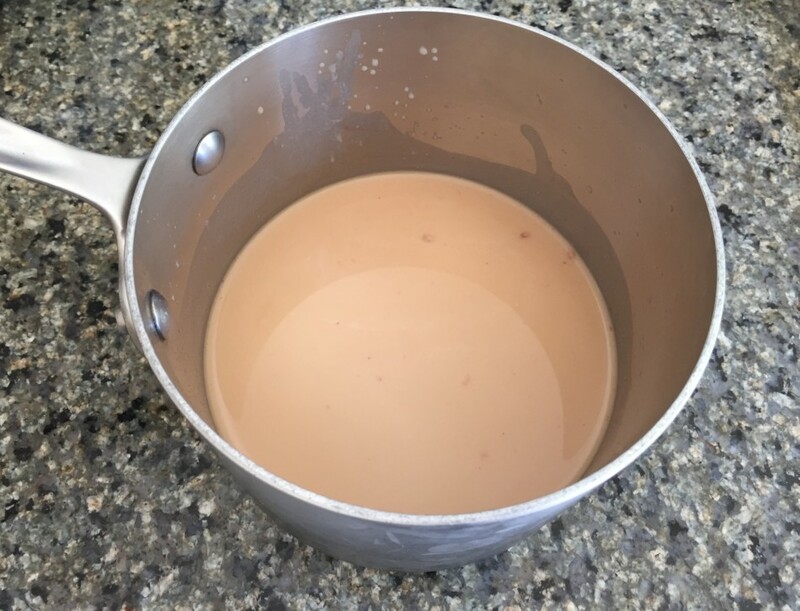 Bring reserved liquid to a boil then reduce heat to medium-low until thickened to the consistency of salad dressing, thick yet pourable, about 20 minutes. 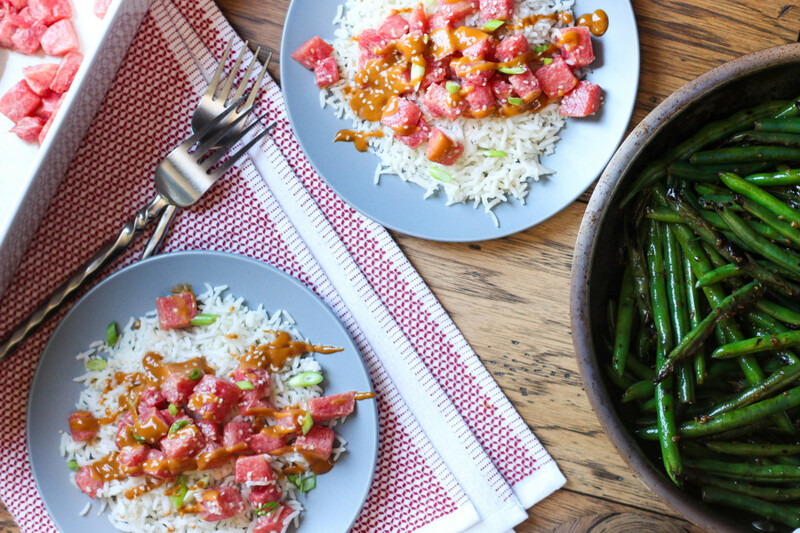 To serve: spoon prepared rice, top with watermelon, drizzle sauce and garnish with sliced scallion, sesame seeds, and optional fresh cilantro along with a side of blistered green beans. Notes: The original recipe states: “remove watermelon from marinade; set marinade aside. Cook watermelon, tossing often until lightly caramelized and dried out…” - I chose to keep it raw for the additional fiber and it was superb. 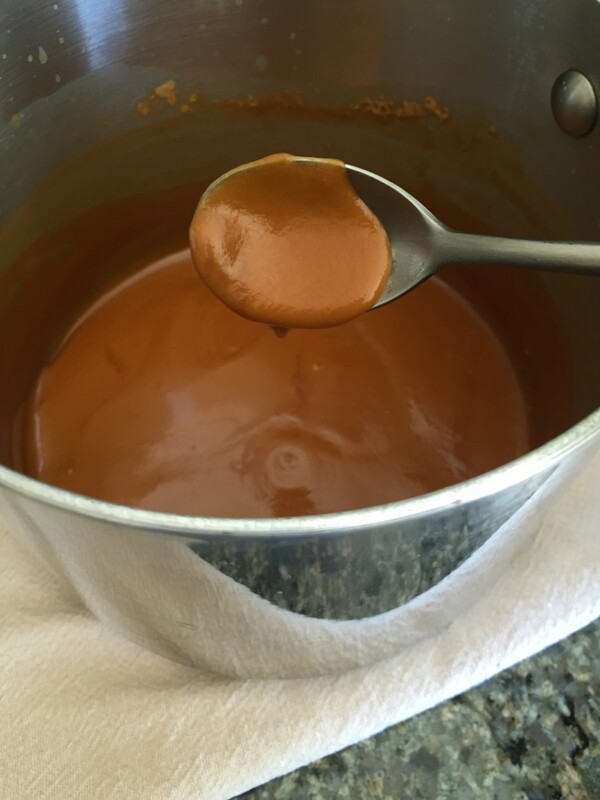 It does create milky-looking cubes since the marinade coats well, which we loved. Drying out the marinade until lightly caramelized makes for a more visually appealing dish, which I didn’t choose to do, so I’m not sure on how that would taste. If you choose to please share in the comments. Basmati or brown rice is another good option. Brown rice will need 5-10 more minutes of cooking time. *Coconut nectar is in the honey and maple syrup section of most health food stores or online. It has a lower glycemic index than any agave or honey and is an unrefined sweetener that has a rich taste to it similar to brown sugar. It is pricier than other sweeteners but a little goes a long way and it has a good shelf life when refrigerated. **Coconut teriyaki can be found in most health food stores or Amazon. It tastes very similar to soy-based teriyaki and this brand makes a good one. It's not often we come across such heartwarming stuff - how lovely a dish and yes, I'm with you about the watermelon. I too am an addict. Thanks a lot! What a clever idea. You converted a sweet treat into a savory meal. Perfect for a summertime meal. I've been wondering what those poke places are. They have been opening up all over Los Angeles. Your dish looks really yummy. It's a light dinner alternative for these hot summer days. Looking forward to making it this week. Delicious! I marinated my watermelon this morning and it was seasoned well. The sauce is to die for. Thank you for my new way to have watermelon!! Needed something summery today so I gave this a try. Marinade is amazing. Love everything about this! I was so intrigued by the creativity of this recipe that I had to try it and wow it is like nothing I have ever had before. 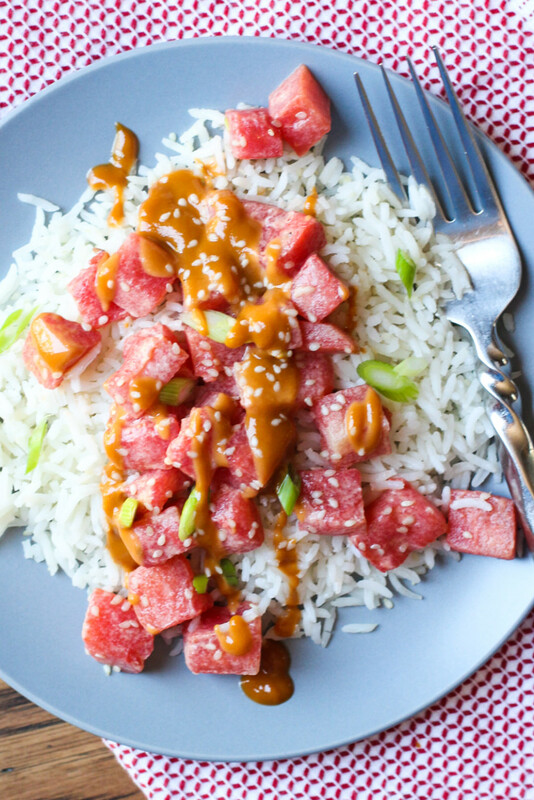 The sauce with the watermelon is just delicious. I followed your lead and paired it with rice but didn't make the blistered green beans since the green beans looked horrible at the market but I will definitely need to soon. Will be trying your black rice porridge next. Happy to have found your blog, so many tasty looking recipes to try!